Motorola and their modular approach to smartphones is something we have seen a lot in the past. From a speaker to an extra pack of battery, to a camera module, everything is there on offer from Motorola. However, Lenovo owned Motorola, made an announcement back in August 2018 along with their Moto Z3 that had everyone excited back then. 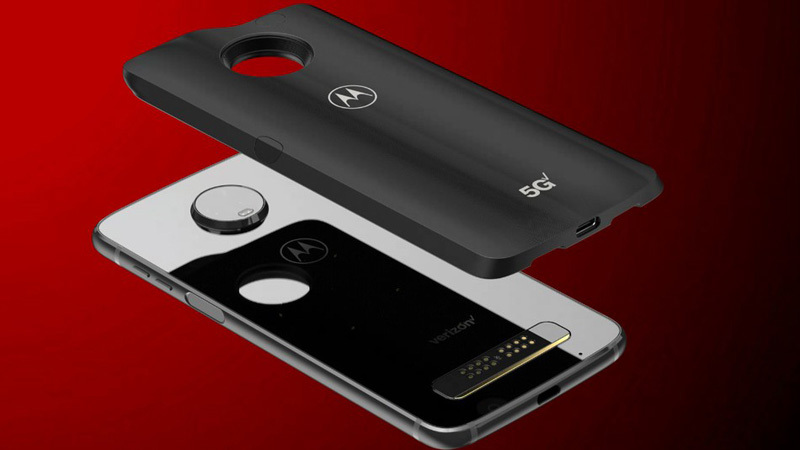 It was about the launch of a 5G moto mod which would make the Motorola phones 5G compatible. The launch is nowhere as the mod is actually there on their website for pre-orders in the US. Motorola has worked together with Verizon on this project to make the 5G Moto mod a reality. This Mod is an attachment that hooks to the back of the smartphone to enable the 5G network. As of now, this mod is not compatible with the other devices by Motorola, but only with Moto Z3. So in order to get the benefits of this mod, the user needs to own a Moto Z3 along with a working Verizon 5G plan on that phone. The mod is currently available for pre-orders, and the retail unit will be out in the stores starting from 11th April. As part of a special offer, Verizon is offering the Moto 5G mod at 50 USD if the owner owns a Moto Z3 with a working unlimited Verizon plan. On top of it though, the user needs to pay 10 USD per month for the next 24 months as a condition for the offer. The price without the offer stands at 349.99 USD and together with the 480 USD Moto Z3, the price for a 5G connectivity in just a few selected regions seems like a lot. Even if the user belongs to that region, the price is a bit over the top considering the smartphone on hand. It would be a better deal to wait for a couple of months and select any 5G enabled device that is scheduled to be launched in the next couple of months. The 5G mod from Motorola and Verizon comes with their very own Qualcomm Snapdragon 855 along with Qualcomm’s x50 modem that enables 5G connectivity. It comes with a total of 10 antennas, four for 4G LTE connectivity, four for mmWave radio and the remaining two for sub-6 GHz connectivity. The Mod also comes with a 2000mAh battery that can be charged quickly using the type c port present at the bottom of the mod. It also comes with splash resistance, so in case you accidentally spill some water on the device you have nothing to worry about. Definitely, Moto Z3 together with the 5G Moto mod is one of the first devices to offer 5G connectivity when even the service providers are behind on providing the connection. The United States will be the first place to have 5G connectivity so the US only launch of the Moto 5G mod makes sense. However, other devices that are soon expected and known to follow on the trend are the Samsung Galaxy S10 5G, LG V50 Thinq, Xiaomi Mi Mix 3 5G and Oneplus 7. Now as far India is concerned, 5G is still not something that will be available this year. Indian service providers are expected to offer 5G services starting from mid-2020.